This weekend the official news agency of the Democratic People’s Republic of Korea announced that it had successfully launched a rocket deploying a satellite into orbit. "The glorious rocket launch gloriously launched a satellite into orbit from where we are receiving patriotic signals and news that our glorious leader, Kim Jong-Il, is returning from having set foot on Jupiter," said a spokesman for the North Korean government. "The Dear Leader is returning to glorious North Korea having had a summit meeting with his father, the Great Leader, in the Great Red Spot of revolution on Jupiter and inspecting the people’s glorious new bouffant wig production facility on Io." The United States and South Korea however dispute the success of the mission, claiming that the 5 year round trip to Jupiter was unlikely to have been completed in a weekend and that the rocket instead crashed into the Pacific Ocean. It also added that Kim Jong-il’s father, Kim Il-sung died in 1994. 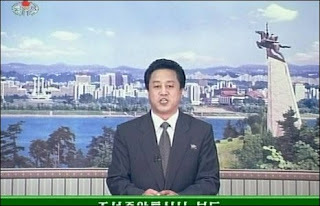 "The glorious data from the glorious satellite contains our Dear Leader singing revolutionary songs as he rows the glorious symbol of glorious North Korean tractor based space technology across the skies and back to glorious North Korea," said a presenter on Korean Central Television. "This is another breakthrough for glorious North Korea and marks yet another glorious achievement following last week’s glorious news that last week Kim Jong-il had gloriously cured cancer and discovered the secret to eternal youth. All at the age of 29." The news of North Korea’s rocket launch is believed to be a cover for missile tests and the latest step by the secretive communist country to develop long range ballistic capability in parallel to it’s nuclear programme. This despite widespread reports that the country has been suffering a famine for several years, something that was also denied by the regime in Pyongyang. "The puppet regime in the South wishes to spread the lies of the obese, capitalist pigs of the United States," said a North Korean children’s television presenter. "However all children should join their parents in rejoicing at the news by gloriously going to bed without food to mark the hundredth glorious day of dieting." North Korean officials said that the capsule containing Kim Jong-il would soon return to Earth. It would remain out of radio contact until it had descended through the clouds over the Cuckoo-land area of North Korea. It will then be met by a delegation consisting of Elvis Presley, Superman and Godzilla who would present him with a Golden Fleece and ceremonial diamond encrusted platform shoes donated by the orphans of Pyongyang.